Here is an exciting writing and mark making area I created which should hopefully encourage your child to have a go and practise their writing skills. The wall was painted using magnetic blackboard paint. LOTS of coats are needed to make it magnetic. I used 5 coats and although i could stick on some miniature magnetic words on a magnetic strip, the usual 'plastic letters' with a magnet on the back were too heavy. The table was painted using standard blackboard paint. Both the wall and the table worked well with the chalk and enabled a large writing area both vertically and horizontally so that your little one is able to practise both their gross and fine motor skills. 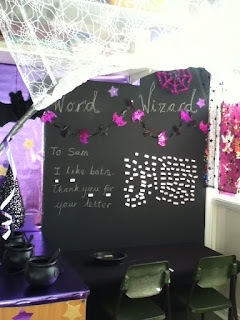 To make the area more exciting, i included 'wizard writing hats' for use when having a go at writing (Ebay), some plastic cauldrons with letters and spoons inside and also some gel glitter dry wipe boards (not pictured) for extra sparkly magical writing. Cobweb and star materials were used to give a real 'wizard cave' atmosphere to the area. Blank spell books and pencils painted to look like magic wants were also included , along with mini jars of spell 'ingredients'. Some wooden chairs - painted and then decorated with Sharpies would make a great addition!